The wedding service which you are anticipating is different from many other wedding services in that it is a Christian wedding. Christian couples want their wedding ceremony to be characterized not only in dignity, reverence, and joy, but by the very Spirit of Jesus Himself. A Christ-centered wedding service, however, imposes particular responsibilities just as it offers particular blessings. 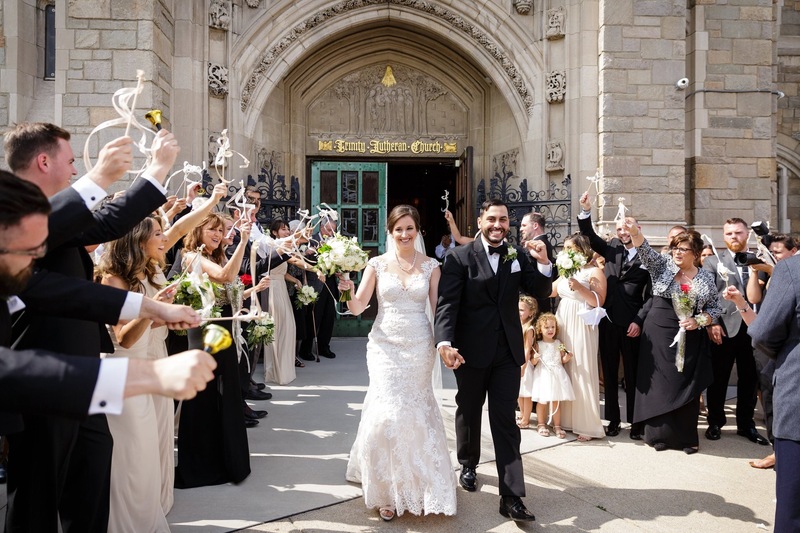 A couple wanting to be married at Historic Trinity Lutheran Church should contact the pastor for a personal conversation before making any final arrangements concerning their wedding. Dates and times for the wedding as well as the rehearsal should be made well in advance, and appropriate deposits and forms should be completed before your date and times are secured. Attend Church weekly as a couple. It is imperative that the foundation of your marriage begins in regular worship of Christ Jesus. 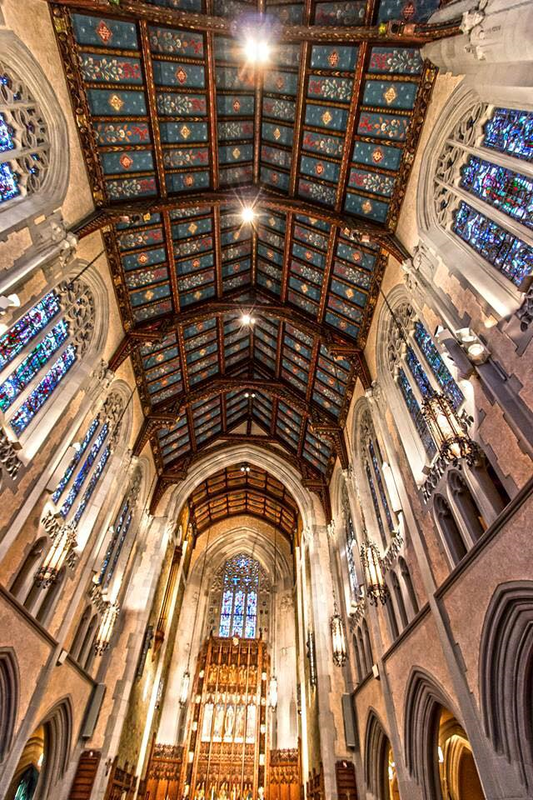 While you will always be welcomed to worship at Historic Trinity, please worship the Lord at your home church! Attend a Premarital Seminar. Historic Trinity Seminars are generally offered annually on a Saturday in February. You will receive additional information as it becomes available. Marriage is an honorable estate, it is not to be entered into lightly or unadvisedly, but reverently, deliberately, and in accordance with the purposes for which it was instituted by God. With this in mind, the pastors of Historic Trinity joyfully regard our responsibility to prepare couples seeking marriage to glorify God in and through this marriage. The Christian wedding service is an act of worship. It is a ceremony in which Christians come together—with the bride and groom—to offer special thanks and praise, and to ask the Lord’s blessings upon the bridal couple’s life together as husband and wife. As bride and groom, you have particular reason for thanksgiving. It was God who brought you together and who will unite you as husband and wife. And it is God who has given you an example of perfect marriage in the relationship between His Son, Jesus, and His Church. But the Christian congregation gathered with you on your wedding day also has reason to thank and praise God on your behalf. Here the congregation of the “saints on earth” joins with you, asking the Lord’s blessings upon this new family. The wedding service you are planning is a part of the public ministry of the local congregation, and the pastor is functioning in his role as pastor of the church. As part of the public ministry, the church has the joyous responsibility to see that this service is carried out in a reverent and dignified manner, and is in harmony with the principles of Christian worship, focused on our loving God. The wedding service, therefore, is even more than simply the bride and groom offering their worship. It is an opportunity for all present to worship God, share in your joy, and offer prayer on your behalf. The entire church shares in this wonderful celebration. You are coming into the house of God to ask His blessing on you as you beginning your life together as husband and wife. All of the music in your wedding should reflect this theme. Whether you choose to use organ music, piano, soloists, congregational hymns, or instrumentalists, it should be remembered that the purpose of the music is to praise God and ask His blessings upon all who are gathered in His house. All weddings use the Historic Trinity Organist, unless otherwise arranged by the Head Pastor. The organist will play for the wedding and provide one 20 minute consultation period for the stated fee. Other consulting time, or additional time with a soloist or instrumentalist will be billed separately. Outside organists must meet with the organist of Historic Trinity for instructions on the Skinner organ. You will be responsible for paying outside organists their fee in addition to our flat rate. Soloists or instrumentalists are available for a fee and must be paid in full prior to the rehearsal. It should also be stated here that certain music, often heard at weddings, is not appropriate for a wedding in the house of God. Music that draws attention away from God to the bridal couple, secular love songs, music designed only to show off the virtuosity of the musician, and the like, are out of place. The Music Director will work with you so that the music, like all other aspects of the service, will give glory to God. Before the Service: The bride and her attendants may dress at home or in Historic Trinity’s Eberhard Conference Room. The building will be opened one hour prior to the wedding service stated time. 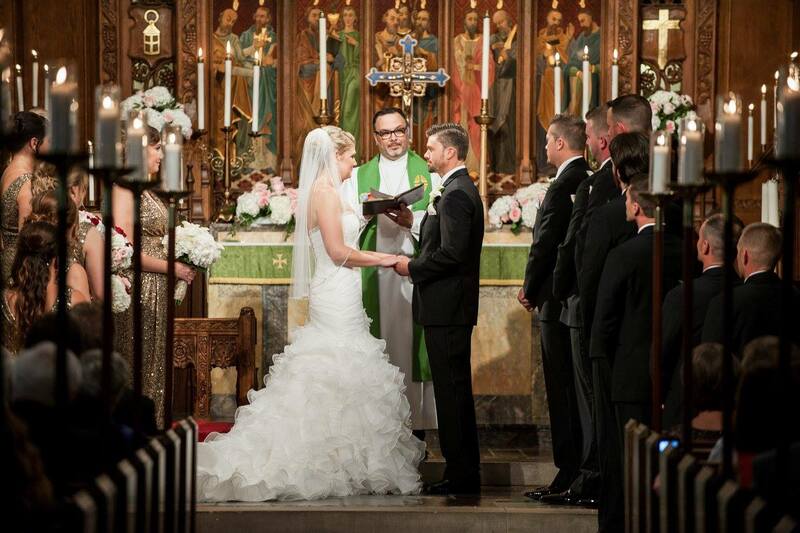 After the Service: The bride and groom should decide if they want a receiving line at church or at the reception. Keep in mind that a receiving line at the church could easily last 30-60 minutes (and this, before pictures). During the Service. If you would like to do things differently in your wedding service, by all means, ask the pastor. It is possible to change a variety of aspects without changing the Christ-centered focus. Wedding Coordinator. Historic Trinity’s Wedding Coordinator will help you with many of your specific questions in regard to the worship service and the use of our congregation’s facilities. You will find the use of this Coordinator indispensable in preparing for your special day. Photographers: Photographers and videographers are welcomed at a Historic Trinity wedding service. Please discuss your thoughts with the Wedding Coordinator as soon as possible. There are to be no flash pictures taken from the time the pastor begins the ceremony with the invocation, through the benediction. Thankfully, professional photographers have the necessary equipment to provide memorable pictures without a flash. Portrait studio photos before the service are limited to 30 minutes and must stop in time to assemble for the ceremony. Photos following the wedding service are limited to 45 minutes. Florists: Arrangements for floral decorations should be made with the florist of your choice. Most florists will be able to suggest various decorations for your consideration. Flowers should be in a 7 inch dish with real flowers only. If a florist is not familiar with Historic Trinity, he/she should be informed that it is not permissible to use tape, nails, or tacks on the pews or woodwork. No artifacts, banners or decorations in the church may be moved or rearranged. Please note: Historic Trinity will not change the seasonal altar colors for weddings. Rice, Birdseed, Confetti, etc. We rejoice with you… but we ask that you cooperate by not scattering rice, birdseed, confetti, or tissue paper, either inside or outside of the church building. Alcohol and Smoking. First and foremost, Historic Trinity is a place of worship. We ask your cooperation in helping keep your church set aside for a special purpose. Please do not bring alcoholic beverages onto the premises. Note also that our facility is a non-smoking building throughout. Candles/ Candelabra: If you wish to use our unity candelabra, please speak with the wedding coordinator. We provide aisle candles and a unity candle as part of the wedding ceremony. Ring-bearer/ Flower girl: Children who serve in these capacities must attain the age of three before being included wedding party. Exceptions may be granted in consultation with pastor. Rehearsal: All rehearsals should begin on time, generally last approximately 45 minutes. The Sanctuary. You may want to know that there are 40 pews in the sanctuary, 20 on each side. The sanctuary aisle is approximately 75 feet long. The Wedding Director can help you determine appropriate decorations for the wedding service. We can comfortably seat 350. Marriage License: The State of Michigan requires that a license for marriage be obtained and that the couple fulfill the legal formality of pronouncement. A license may be obtained in any county in the State of Michigan. The marriage must be officiated within 30 days following the date of issue. The license must be presented to the church office no later than the Monday before your wedding. Wedding Folders: Wedding folders are optional. You will be responsible to purchase appropriate covers. Christian bookstores and online resources carry a wide variety at reasonable prices. You can use the titles from the order of service provided. Most couples prefer to include the names of parents, attendants, participants, etc., on the back page. Please approve the worship folder with the pastor before going to print. All wedding fees are to be paid in full within a month of the wedding. A non-refundable 25% deposit is required to secure the wedding date. Your wedding date will NOT be reserved until the deposit is made. Checks should be made payable to Historic Trinity. Payment can also be made on our secure website. Historic Trinity Wedding Fee: $1,800 (discounts provided for members and area non-member Lutherans). One fee covers everything: Use of church, pastor, organist, wedding coordinator, light/audio tech, parking lot security, and the expanded use of parking (which we must rent) for both the rehearsal and wedding.